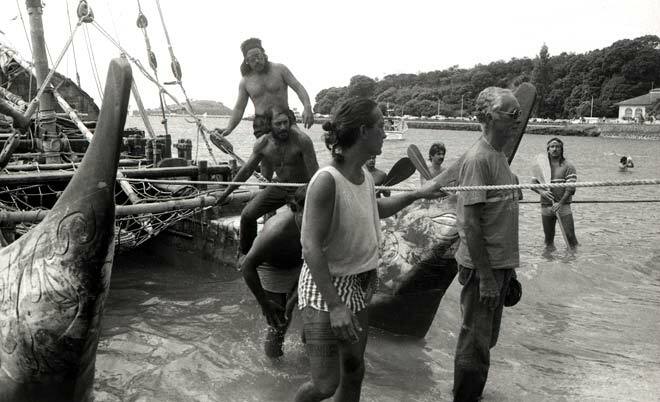 Matahi (Greg) Brightwell and Francis Cowan are shown with other crew members of the replica double-hulled voyaging waka Hawaikinui on its arrival at Ōkahu Bay, Auckland. Its hulls were made from two tōtara trees from Whirinaki State Forest. These were hollowed out in Porirua and Pahīatua, then shipped to Tahiti for finishing. Hawaikinui sailed from Tahiti to Rarotonga, then on to New Zealand, in 1985. Cook Island, Tahitian and Māori representatives welcomed the vessel ashore.